Over a thousand tourists were stranded on Easter Island in the build up to Christmas. Some never made it home in time. A look of resignation sits uneasily on the hundred or so passengers lined up outside Easter Island’s Latam Airline (LAN) office in the early hours of Monday December 21. Some have been camped out since dawn. For many, this is the fifth day that they have been queuing for a flight off the island. “It’s like we’re being held hostage on our honeymoon,” says Alexandra Wenman, 38, an Australian holistic therapist, who came to the remote Pacific island with her husband, Anthony Reed from London. By now the couple are supposed to be in Cusco with friends about to visit the famous Inca ruins of Machu Picchu. 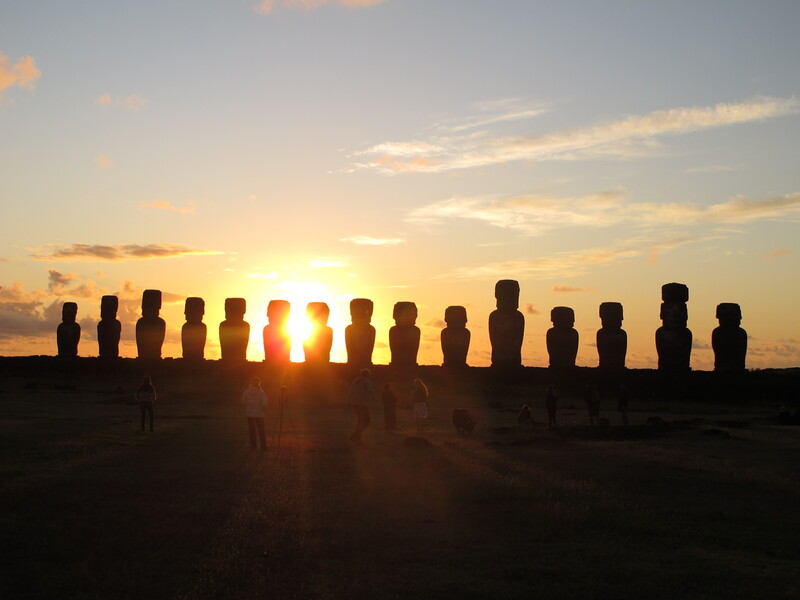 Instead they are standing about just like the giant moai statues that have made Rapa Nui, as it is known by the islanders, a popular tourist destination. Staff at Chile’s airports announced a 48-hour strike that commenced on December 17, but was later made indefinite as negotiations between workers and management stalled. 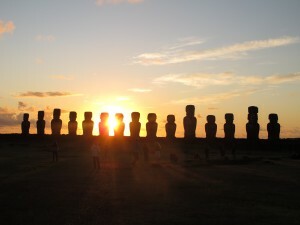 Easter Island is a dominion of Chile, and only LAN flies to the airport. In effect, the island became cut off from the outside world for four days. Finally, the strike was called off on December 20. “The worst thing that LAN did was to fly people out here knowing that there was a strike,” adds Wenman. Declan Roche, 51, an accountant from Cork, Ireland, was on the last plane to fly from Santiago airport to Easter Island on December 16 – hours before the strike was due to commence. He was allowed to check in, even though his was a 30-hour trip and his return flight to Santiago would be cancelled if the strike went ahead. Nobody informed him about the strike or gave him the option to cancel his trip, which he would have done. “All my clothes are in Santiago,” he adds in his bathing shorts. LAN officials claim that passengers were informed of the impending strike with a notice being placed on the official website in Spanish. Although this is something contested by Karen Chandler-Smith, 41, a scientist from Cambridge, who says the announcement was placed only after the strike had commenced. Chandler-Smith was due to join a cycling tour that started on December 20. Like everyone else queuing at the airport, rather than outside the LAN office, she is just hoping to get off the island on one of the two scheduled flights today from Easter Island to the mainland. Geography works against the estimated 1,200 people stranded on the island. Easter Island is the most remote place on earth. The nearest populated island is Pitcairn some 1,900km away. The South American coastline lies 3,700km to the east. This is something recognised by Cristian Aguila, LAN’s regional chief for Easter Island. “We are maintaining the situation and are working now,” he says through an interpreter at the airport. Despite the universal criticism from passengers about lack of information and uncertainty, Aguila says that his staff did all they could, including rescheduling flights on a day-by day basis. This was not a view shared by his customers, who claim they received more information from tour guides and hotel staff than from the airline. Another major complaint was the closure of both LAN offices on December 19 – the third day of the strike – even though it was scheduled to be open in the morning. “Our staff and the police asked for the office to be shut,” says Aguila, adding that he had placed the safety of his workers ahead of the concerns of his customers. However, later he admits that the closure was a pre-emptive measure, and that none of his staff had been attacked by disgruntled passengers. As the strike continued into Day 3, LAN handed over responsibility to the governor’s office, allowing military planes to land at the airport, providing medical supplies and emergency provisions, as well as removing over 200 passengers on Sunday, December 20. Although these passengers were supposed to be prioritised by those most in need, many excluded passengers complained that the first list of 50 passengers contained only Spanish names on it, assuming Chilean nationals had been given priority. Some of those queuing up on December 21, including Wenman and Reed were at an initial meeting held with the local governor on December 17, where they were requested to make a case for being included on the military planes. After queuing up for days, they felt that they had just been wasting their time. Tom and Gale Brandt, were also at that initial meeting. Like Wenman and Reed they were still queuing for their seat off the island several days later. The retired American couple were due to join a cruise to Antartica that cost them $40,000. To compound the problem further, few are likely to receive any compensation. Aguila confirms that the airline will not be offering any compensation, as the dispute lies outside of its control. However, most of the passengers spoken to felt that the airline was culpable, due to the lack of information provided, and in particular in allowing passengers to enter the island when it knew that they would not be able to leave if the strike went ahead. “They should have told us,” says Tom Brandt. “They took our money in a laissez-faire type of attitude,” adding that he originally heard of the strike from a tourist on December 15. When the couple tried to reschedule their flight to December 16 – the day before the strike commenced – they discovered that the flight was fully booked. It is not just the passengers who are suffering; the islanders are losing much needed income as the stranded tourist renegotiate their room rates and economise to make their limited resources last longer. Hotel owner Marcelo Valdes does not know when his next customer will come. “Today I have four customers confirmed, but I don’t know which plane they are coming on,” he says on December 21. A cry of joy bursts out from the front of the queue outside the LAN office shortly before midday on December 21. Luis Alves Martins, 46, has just won the lottery. The Portuguese IT architect has been queuing since 6am and finally emerges five hours later with his boarding pass for a flight later that afternoon. He should be able to make his connection to Cusco and then Lisbon to be back in time for Christmas. New Zealander doctor Fraser Welsh, 38 was supposed to start his new role as general surgical fellow at Dunedin on December 21. Instead he is one of many informed that the LAN office was no longer checking people onto flights and that he would have to walk the kilometre or so to the airport to join the queue of people there. He eventually gets a seat for a flight on December 22, but once more the gods are against him, as that flight is cancelled for technical reasons, and he eventually departs the island the following day. “I was not able to make the connection to Auckland and had to wait a further 24 hours in Santiago airport,” he explains. “I finally arrived in Auckland at 5.15am on Boxing Day. My Christmas Day lasted a few brief hours cramped in an economy class seat at 36,000 feet. As well as potential loss of wages, Welsh estimates that he spent up to 900 NZD (over £400) on hotel fees, rescheduling flights, food and drink over the five extra days he spent on the island. However, more than the loss of money was the sour taste the experience left in his mouth. “I’d always wanted to see the island. I remember reading about it in an old National Geographic as a young man and was captivated by the story,” he says. Wenman and Reed are more fortunate. They manage to get on the same flight as Martins. Fortunately, they managed to reach Peru for Christmas. “We had a great time in the end,” says Wenman. “We ended up going to Cuzco for Christmas and did Machu Pichu on Christmas Eve and a tour of the Sacred Valley on Christmas Day.” The couple celebrated their first New Year’s Eve as a married couple on Copacabana beach in Rio watching the “awesome” fireworks. Now her Easter Island ordeal is over, Wenman is able to see the bright side of things.